It works just like any other communications tool of this ilk. You create a Keybase Team and begin generating chats and channels. You can also share encrypted files with the team. The interface should have a familiar look and feel. The team admin gives the team a name and can add members, which works on a signature chain. Only admins have full privileges on the chain and the ability to add or remove members. It’s worth noting that team name can only exist once in Keybase Teams, so there can never be two teams with the same name. The team admins can also create sub-teams off the main teams. But the true differentiator here is the end-to-end encryption, which Keybase says should give you full peace of mind that no servers can be hacked or communications sniffed out, leaving communications completely private and protected. Keybase has taken many precautions to ensure the privacy of these communications to the extent possible. “At no point does Keybase have any private keys for any file or chat data. Your device keys never leave your device,” Keybase made clear in the blog post announcing the tool. What’s more, the company says that the product is free, but even if they start charging at some point in the future for enterprise customers, they say that they will never charge anyone who has created teams prior to that time. “Put most simply, we eventually want to find a way for actual enterprises to pay, while keeping personal and community use free. And any use now is grandfathered in,” the company stated in the blog post. Keybase says the product is evolving quickly and there should be regular updates in the coming weeks that will add to and improve the overall experience. 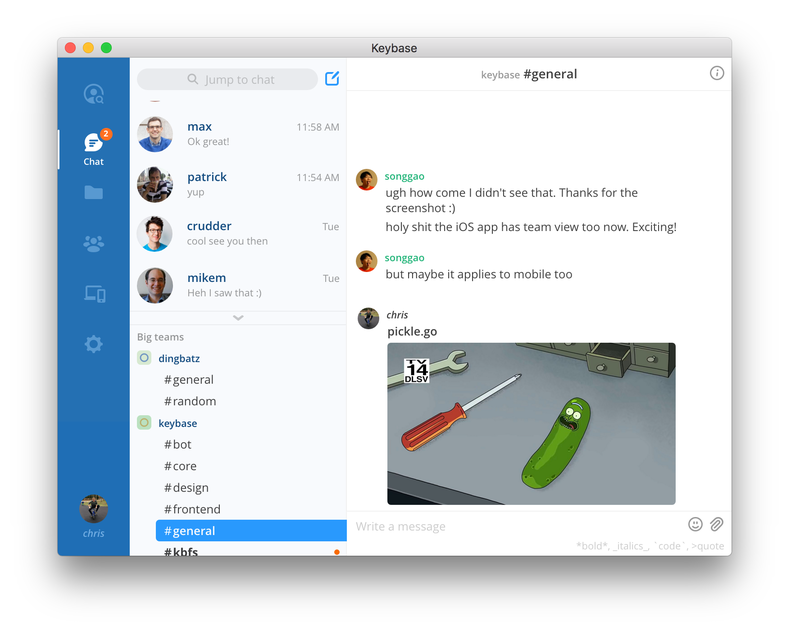 Keybase was launched by the founders of OK Cupid in 2014. The company has raised $10.8 million.